Fair Trade offers poor artisans an opportunity for positive change, providing them with adequate resources to support themselves and their families. We can see concrete changes in the lives of the artisans we work with as a direct result of the increased profits they earn through Fair Trade practices. Improvements are made to crumbling houses, better nutrition results in improved health care, children go back to school where once there was no money for such luxuries, and there is an increase in the access to basic services such as electricity and water. In addition to concrete improvements Fair Trade offers social benefits as well. Women who were once only valued for their work in their households now are respected in their homes due to the money their work adds to the household. Jacobo Norori was 18 when Esperanza en Acción first began working with him. 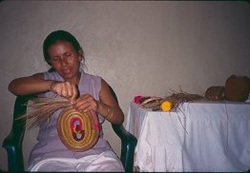 He is the son of Guadalupe Norori, a well-known artisan of Esperanza en Acción. Jacobo learned to make ceramics from his mother and soon began working on his own in order to help support himself and his family. When Esperanza en Acción first started working with him he had no sales contacts and worked in a very basic geometric style. Esperanza en Acción helped Jacobo improve his designs and now he has become one of the potters with the most diverse designs in all of San Juan de Oriente. 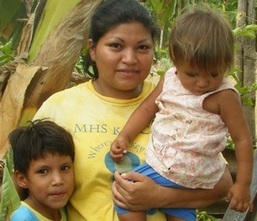 Only 8 months ago, Angela began working with our artisan group in El Timal that makes jewelry from recycled chip bags. Thanks to sales that the group through Esperanza en Acción, she has begun to earn money to help supplement the money her husband earns as a carpenter. High atop one of the mountains that separates Nicaragua and Honduras lays the small town of San Jose de Cusmapa, deemed the poorest community in all of Nicaragua. Most workers earn their money through subsistence farming and bring in the equivalent of $1 a day to feed, house, and clothe their families. Despite this desperate reality the community has a reason to hope, as forty-five women are transforming their situation and benefiting from the power of Fair Trade. Since 2002 these women have been organized in a cooperative that makes baskets out of pine needles, a raw material that is abundant in the mountainous region. With the help of Esperanza en Acción and other organizations they are selling their baskets at a fair price and have dramatically increased their income for their families. Their production has even generated a micro-economy for collecting pine needles which provides opportunities for others not involved in the making of the baskets to earn more money as well. Elizabeth Gonzalez left her home in the dark at 2am on February 6th and boarded a bus for the seven hour journey to Managua, Nicaragua to learn about how to better sell and market her pine needle baskets. Like many artisans, Elizabeth faces obstacles that make selling her products difficult. She lives in a rural area near the Honduran border where tourists are scarce and transportation to get to other villages is expensive. She relies on any orders she can get from folks who happen to be in her village or on Esperanza en Acción to promote her product for her. Elizabeth and 27 other artisans from all over Nicaragua convened in Managua for a two-day training on Marketing and Sales, funded by donations from our generous supporters. Artisans spent two days sharing their knowledge and exploring new ideas of how to promote and sell their products. They learned the importance of great customer service, what techniques they can use to market their products, how to offer their products to new and existing clients and how market demand can affect the price of their work. For many this was the first time they had the opportunity to learn about how to offer their products to a client.